Wooden nativity set- suitable for little hands. 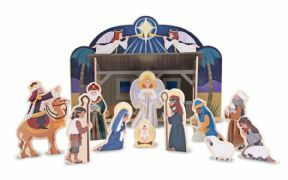 Delightful wooden nativity set, ideal for little fingers, so there is no worries over little pieces or breakges to the adult ones. Share the first Noel with your little one through this lovely little set. Set consists of 11 wooden standing figuires (three kings, three shepherds, one sheep, an angel, and of course Mary, Joseph and the baby Jesus) and a four piece, easy to assemble stable.